Is It Wrong That This Game Makes the BP Oil Spill Fun? The latest diversion from the people behind cute, addictive iPhone games like Angry Birds and Cut the Rope has you fighting an evil conglomerate (initials BP) accused of mining the earth's riches and destroying the environment. In Blopster you control a cartoonish bit of red liquid tasked with cleaning up after a sloppy and greedy executive who allowed his company to despoil the planet with a drilling accident. Players guide Blopster, the planet's foremost expert on energy-producing, environment-killing blobules, on a journey through forty levels, spread across four different settings. To play, gamers tap either side of the screen (or tilt your iPhone or iPad) to move Blopster across the screen. You can also tap him and drag down to pull at his elastic hide. Lifting your finger releases Blopster and sends him shooting in the opposite direction. The levels feature a variety of dangerous creatures, radioactive material that can temporarily give Blopster special powers, water that will instantly kill him and a set number of blobules that need to be collected before Blopster exists the level. The more blobules you collect, and the faster you do it, the higher your score. While Blopster isn't exactly swimming in subtleties, it still delivers a fun, hard-to-put down experience wrapped in the veneer of, I don't know, some sort of message. We learn at the beginning of the game that Bloptopia is reliant on blobules, the fuel that apparently powers everything in this blobby universe. We're also told the blobules come from deep within the "fertile land" of the planet. That Big & Powerful LTD (B&P) is Bloptopia's biggest producer of the blobules, seems to be more of a joke then any sort of meaningful message. 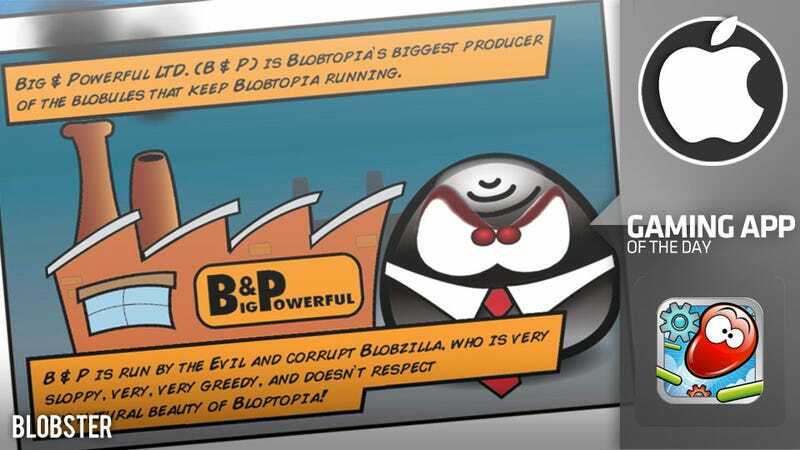 That holds true even after we're next told that the company's owner, Blobzilla, doesn't "respect the natural beauty" of his planet and that he eventually screws things up with a massive leak. The fact that Blopster is some sort of blobule expert sort of makes things a big confusing in the analogy department, especially considering that he gets super powers from radioactivity. The game's end goal is to somehow force B&P into bankruptcy by collecting these blobules. But what about Bloptopia's over-reliance on blobules? What will they do to replace B&P once it goes under? Is this going to lead to some sort of global economic meltdown or war on Blobtopia's foreign interests still rich in blobules? Maybe I should just get back to slinging blobs across the screen and lead the Bloptopian policy making to its Blobzillas.